You can read any Braun Series 7 790cc review from other real users and you will see that they are pleased with their shaver. Not only is the price tag remarkably reasonable, it delivers in all categories – it’s smart, it’s efficient, it’s powerful. The quest for the perfect shave has been long. We’ve had to endure countless models and revisions that shave more from your wallet than anything else. 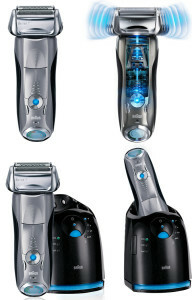 Then Braun turned the market upside down and revolutionized electric shaving with their series of innovative shavers. 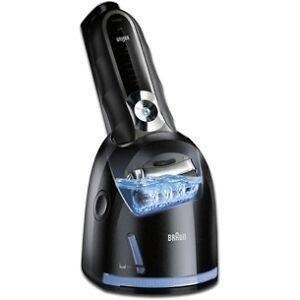 This Series 7 790cc Pulsonic Shaver System really is the best of Braun. Before we dive into the detailed review, however let’s check out the summary box. There’s a lot of stigma surrounding electric shavers. Many men presume that, in the time honoured fashion, if you want a close shave, you have to switch to a razor blade. This is not the case with Braun Series 7 790cc – meet ActiLift and OptiFoil. One of the biggest problems up to this point is that some hairs just don’t grow straight. Lying flat against the skin – especially in trouble-areas such as the neck, most shavers completely miss them. Braun’s ActiLift performs 130 movements per second, lifting flat hair and cutting it – even in these tricky areas. Partner this with Optifoil – the product of fifty years’ experiments and evolution resulting in perfect foil. Ergonomically capture more hair and cut them deeper than ever. 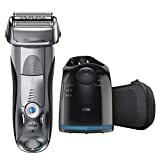 Put the two together and you’ve got the basis of the Braun Series 7 790cc – it gets all the hairs and it cuts them closer than any previous model could even dream of. Braun Series 7 790cc isn’t just good, either. It’s smart. It’s got the world’s only intelligent sonic technology that has the power to read your face. When it’s managed to do that, it automatically adjusts its 100,000 microvibrations to best suit the density of your beard. 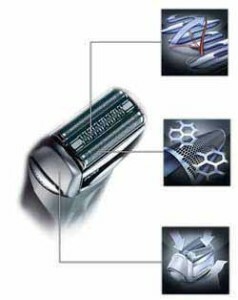 The Braun Series 7 is the only Braun shaver with personalisation settings. You can leave the all-singing, all-dancing features to the shaver, but keep the ultimate control with personalisation settings: extra-sensitive, normal or intensive. You get a shave that is perfect for your skin, your beard. After all, we’re all different – shouldn’t your shaver admit that too? Let’s face it – cleaning your shaver every day, after every use, is a chore. But Braun’s Series 7 shavers offer the world’s only 5-step alcohol cleaning centre. When you’re done, your only job is to return the shaver to the dock and at the press of a button, it cleans itself in just 25 seconds. The dock is a breath of fresh air in itself. Braun promises a fully-charged battery in just one hour, a FastClean in only 25 seconds, automatic lubrication and heat inductive drying – leaving the blades strengthened, clean, dry, and with a fresh lemon scent. There’s always that time with traditional shavers when you have to arch your back, grin ecstatically, frown, yawn … surely it’s about time the shaver did the hard work? Series 7 790cc has a fully flexible, contour adaptive shaving head that pivots and works its way to the trickiest of areas – missing nothing. No need to return to the same spot again. So what does all of this mean? It means Braun has gone above and beyond. Life’s just too short to be wasting time and hard-earned money on inefficiency. 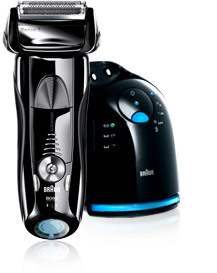 Braun Series 7 790cc, older brother of the Series 3 340 and 380, goes the extra mile: it lifts hair before cutting it, it pivots to suit you, it reads your face and adjusts accordingly, and it even cleans itself, leaving nothing but a fresh lemony smell. What more could you want? “Braun’s most advanced technology for our most complete and comfortable shave.” That’s what they promise – a bold claim. But that’s what you get. We wholeheartedly recommend Braun Series 7 790cc – you won’t be let down.